Flooding is one of the most costly natural disasters that government agencies endure. Floods are a great risk to people and property. Knowing ahead of time that a flood is going to happen, what will be flooded, who will be affected, and how to respond is of great importance to reducing loss of life and property. Does your organization have the capabilities, resources, and tools it needs to weather any storm and safeguard your community? In this blog you will find three critical steps that help you to prepare for and respond to flooding events. Any location can experience floods. Unfortunately, most areas lack predictive models showing what the next flood will look like. The first step is to build a flood inundation model. To do this you will need a Digital Elevation Model (DEM). This can be created using USGS National Elevation Data, Light Detection and Ranging (LiDAR) data, or contours derived from either of these data. The DEM would then be used in Arc Hydro to create the inundation model which consists of rasters and polygons. Once you have your flood inundation model you can use it in combination with asset information to determine what infrastructure will be impacted. Use it with demographic data to determine how many people will be in danger. Identify critical sites like schools, assisted living residences, and hospitals. In this image you can visually analyze different flood stages of inundated areas and flood depth at the location of the selected flood stage. Click here to try for yourself. In this image, you can see that a flood at the 30 foot stage will impact a population of 1,914, including 181 seniors and 200 people with health disabilities. Preparation allows you to plan ahead. Now that you know the areas of flood and what is at risk you can begin planning. Consider where road closures will be needed. What detours can be put in place? Where are the best locations for evacuation areas? How will you communicate this information? Once you have determined the impacts of flooding create a plan of action for when the flood occurs. Be ready to share your data by creating a web map that can be used in an operations dashboard for your response teams, on mobile devices for your field crews, and provided to the media for news reports. Use this same map in an online application that shares information with the public. Having the map online accessible from anywhere, available at any time, from any device will give everyone the information they need when they need it. A field information dashboard displays work status in real time. with the office in real time. 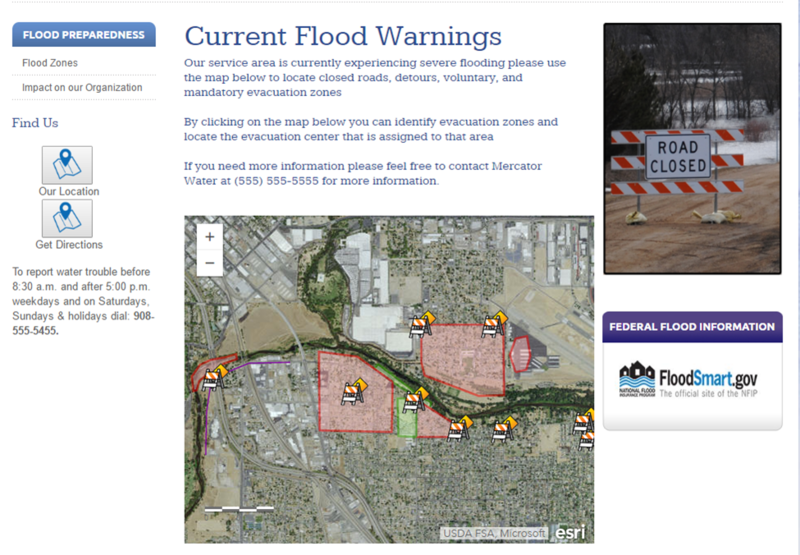 This flood status map, embedded in a website, displays information for evacuation areas, road closures, detours and temporary levees. The live map includes pertinent information such as contact information for the evacuation areas and if the evacuation is voluntary or mandatory. The data that is collected during and after a flood is important. This data can be used to plan more accurately and efficiently for future events. Was the inundation model accurate? Where there differences? Did the field crews have problems routing around the road closures and storm debris? Using visualization and analysis empowers you to get the most out of the data collected. This application uses information from your CMMS to estimate the repair or replacement costs for flood impacted infrastructure. Esri is helping organizations to prepare, plan, and recover from flooding. 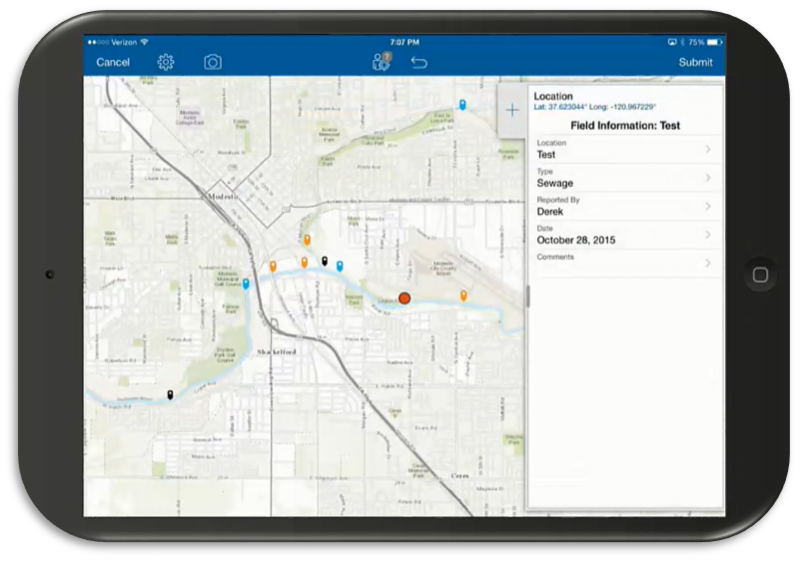 Esri is working with organizations such as San Bernardino County to make sure that people and assets are safe during flood events. Partnering with real “boots on the ground” has helped Esri to create flood management solutions that really work. 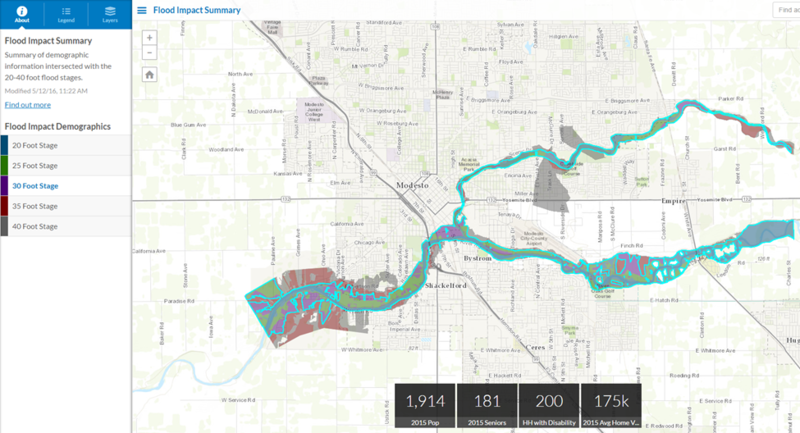 Please join us for a special webinar, Flood Best Practices: Protecting People and Property with GIS, where San Bernardino County is going to share how they developed and implemented an effective flood response plan using a Geographic Information System (GIS). San Bernardino County received a 2016 NACo Achievement Award, in the Emergency Management and Response category, for their Storm Emergency Computer Application. Register for the webinar today, go.esri.com/floodbestpractices.